Just wanted to share some great advice with you. Faith is the belief in your own desire to create and mentally removing any obstacle that stands in the way of your ultimate desire. Faith is the driving force behind creating the reality that you desire. Neville Goddard wrote a very good book called Your Faith is Your Fortune. It's worth noting that in the scriptures Jesus said have but the faith of a mustard seed and the mountain will be cast into the sea. This lets you know that ANY and ALL obstacles can and will be removed based off the power of your own faith! Faith is the belief that all things work out for the good of those who trust in their Source regardless of the name you use (God, Allah, the Universe, etc). Every obstacle in your life is subject to change. It doesn’t matter what you may be facing, there is an answer in the unseen. 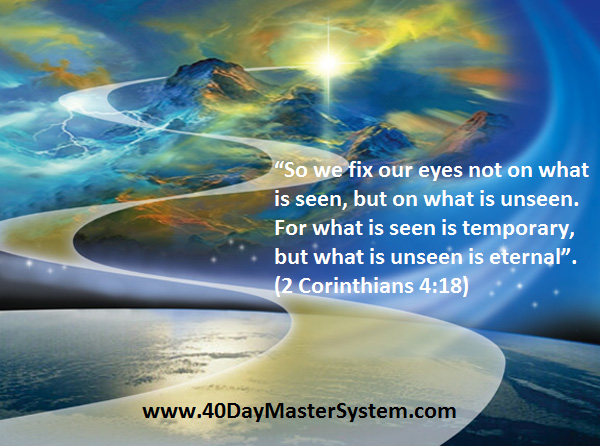 The unseen is the spiritual realm where the promises of God exist. Your faith brings those unseen things into this natural realm. When you are fixed on something, you can’t be moved. There’s a determination that fuels your focus. When you fix your eyes on the unseen—the promises of God—your faith will not be moved by your circumstances and you’ll eventually see those promises come to pass. Make the decision today to fix your eyes and mind on the promises of God. Meditate on His promises until they become more real to you than the air you breath. Declare that His promises will come to pass in your life. Declare that you have His favor. Declare that you are more than a conqueror. Don’t allow fear and doubt to change what you are speaking over your life. As you continue to fix your spiritual eyes on the unseen promises of God, you will see those things come to pass in the natural and you will move forward into the abundant life the Lord has for you!